A 1977 Christmas Story | Peter M. Schloss | J.D. - Mediator. 1977 was a watershed year for us. We were married that June, I resigned my position of 3 years as a State Parole Office, we bought our first home, I started law school… all as Christine chiseled away at her undergraduate degree while holding down a job and raising an active 6 year old boy. We had much to be thankful for that Christmas, but an overabundance of cash was not on the list. Midnight Mass was wonderful. St. Francis Xavier parish had welcomed us with open arms. It was a congregation with an eclectic mix. There were octogenarian parishioner’s who had called this church their home since the 1930’s… and there were college students like us who were drawn to the more liberal “Jesuit” atmosphere. We felt at home there. Loved, comfortable, and embraced by God and his (“her” as Christine would say) children. As special as the service was, it took a distant second place to the spectacle that was laid out for us on our 4 block walk home. The sky was deep indigo laced with countless stars that shined diamond sharp above us. It was a white Christmas. Fortune had given us 4 inches of new-fallen snow over the preceding day. It was deep enough to challenge the footfalls of a 6 year old. Sean stretched to match my stride, finding the reward of using my footprints eased his efforts. Perhaps he was wondering what it would be like to someday walk with the stride of a man. A man!… here I was with family, home, bills, school and with it the nagging fear of failure… it was all upon me so fast. Sean would someday face his own challenges, but for that night his tasks were just putting one foot in front of the other and stemming the pressure of his enthusiasm that Santa would soon be at his new home. As we walked up the steps to our yard, I suggested to Sean that we stand in the backyard and scan the sky for the vapor trails that would be evidence of Santa’s wanderings. To believe in Santa again all one needs to do is look into the eyes of a 6 year old! Christine took her leave, complaining that “you men are just too warm blooded”. Actually, her departure was part of a plan that I had hatched to enhance Sean’s first Christmas in our new (to us) home. The home that he had known over the last few years was a nice apartment, but the vision of Santa arriving on the balcony and opening the sliding glass door didn’t fit the poetic image which began with the words, “Twas the Night Before Christmas…”. We had gone out of our way to make a big deal about our “new” fireplace. It had actually seen its first fire in 1922, and like fine wine it had improved with age, the ceramic bricks taking on the patina of countless fires through 55 winters. That night there would be no fire as Sean insisted that we not take the chance of scaring Santa away. The plan was to engage in a bit of theater. The presents had been hidden in the living room coat closet. When we left for Church the Christmas Tree was decorated, but it stood solitary without any presents beneath it. 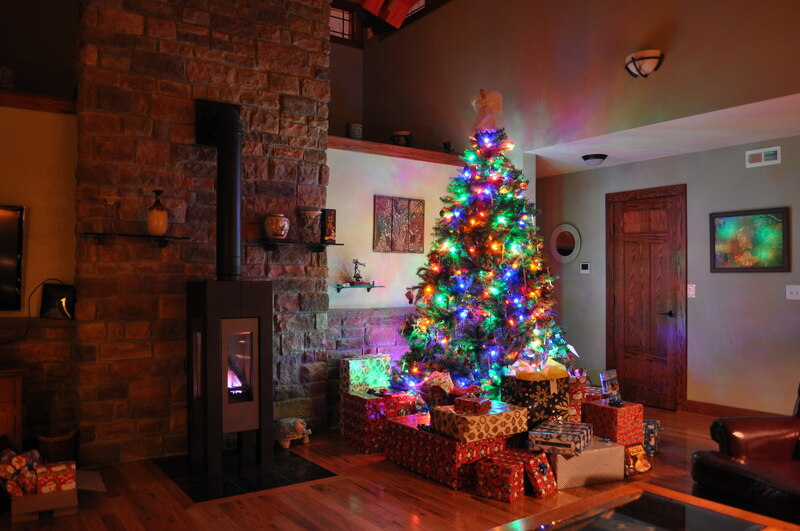 While Sean and I stood in the yard searching for signs of Santa, Christine would hurriedly place the presents at the base of the fireplace and Christmas tree. Out in the yard Sean and I pondered whether a wisp of a cloud here or a dash of smoke there was Santa’s trail. There was a bright moon which echoed its glow on the snow atop our home. I turned my gaze to the roof and yelled, “There! Look there!! Did you see him Sean? It’s Santa on OUR roof!! !” Of course, the pliable mind of a 6 year old guaranteed that Sean saw him too. On perfect cue Christine burst out the back door calling for her 2 “men” to come quick, she had surprised Santa in the living room! We fairly fell over one another as we charged up the stairs and into the house. In the living room we beheld presents where none had been. Sean slowly surveyed the room, his eyes and mouth opened wide. Remember however that this was a “thin” Christmas. We had purchased with care, and most of all, within our meager financial means. Before the fireplace was a pair of roller skates, the kind that take a key and clamp on your street shoes. There was a red wagon, some wrapped gifts, a couple of small toy cars and a yellow metal “Tonka” dump truck. Noteworthy were the absence of items which depended upon batteries for fun. All of these toys depended largely on the power of imagination. It was imagination that we counted on to elevate this Christmas to the status of a “legend” in a child’s mind. Sean’s gaze swept the room and I mentally gave myself a pat on the back for the cleverness of our Christmas “theater”. What I failed to consider was that a child’s imagination, like gasoline, is easy to ignite but difficult to control once afire. Sean’s eyes tracked from the tree and locked upon Christine. His face hardened and his gaze narrowed. His mouth began to utter the words of accusation… “You scared him off… you scared Santa away before he could leave all of the presents!” Christine and I were dumb-struck. I might have thought the irony of this turn of events humorous but for the very real tears that began to fall from my wife’s eyes. She ran to the bedroom. She felt failure as a mother, and I felt failure as a husband. I went to console her. A few minutes together felt like hours. We composed ourselves and resolved to make the best of things. We still had a small child downstairs and it was Christmas. Arm in arm we descended the stairs only to find a 6 year old happily engrossed in the joy of moving imaginary earth from an imaginary construction site with his new toy truck. Nothing more was ever said by him of Santa’s “aborted” visit. By any child’s measure, that Christmas was a resounding success. For us it would take mature perspective gained in the passage of time to temper the bittersweet of that night. We have marked the passage of 41 more Christmases. Three of these brought with them joy in the births of our children Peter (December, 1978), Renee’ (December, 1979), and Alexis (November, 1982). Their births have perennially been celebrations of the season of Christ’s birth, and if you do the math, they are also celebrations of the prior Springs. Christine knows that I enjoy sharing this piece of our history, but signs of the old pain remain… punctuated by a smile, a knowing look, and a squeeze of my hand. So, Merry Christmas to All, and to All a Good Night. ← November 11, 2018. William Alden Nichols, 100 Years and Counting. A very Merry Christmas to you both and your family. And thank you for sharing your story. It’s started my day with a smile. Thank you Charlene! We wish the same for you and your family. Thanks for the story and the beautiful picture of you two. Merry Christmas to you and your troop. May 2019 bring many more blessings your way. Thank you Julie! We wish the same for you and Dom. Thank you Liz. Our love and holiday wishes to you two!! Merry Christmas to you Pete and to Christine. I have really enjoyed your friendship over the years. It is always a blessing to be able to enjoy your rich history. I can always count on you to make my day even better. Thank you so much Lou. Let’s make a commitment to get together soon! Our best wishes to you and your family for 2019. I am so impressed at your memory, Pete. I remember those times. Kids! Thank you Laura. Today will be tomorrow’s memories. May we make and remember them well. A great story, Pete. Merry Christmas you, Christine, and your entire family. Thanks Ken. Merry Christmas and a Happy New Year to you and Nina! Such a sweet story! And how the years have flown by..a great picture of the two of you but I am wondering who managed to “sheer the sheep”?..all that lovely snow white hair!!! enough to make a Santa’s beard for your next bit of theater for the grandkiddies??? Peace and Love! Thank you Max! We have come by this white stuff honestly. It is a tribute to life lived full and well. Anything that Fate grants hereafter is just more “icing on the cake”. Love to you and Chip. What a beautiful Christmas story. You tell it as if it happened yesterday. You have a marvelous way of conveying to your reader incidents that put them into step with what is taking place. There is always a life’s message. Thank you Mom and Merry Christmas!